The Asclepiadaceae comprise a large and diverse group of about two-thousand species of plants split into 300 genera. The Asclepiadaceae were separated from the Apocynaceae (Jussieu 1789) by Robert Brown in 1810. Following recent work on DNA and other studies, they have been merged back into a sub-family of the Apocynaceae. Most people seem to have accepted this revision, although only time will tell if it becomes permanent. 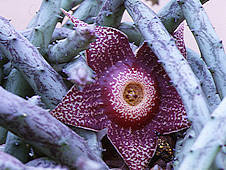 Other succulent Apocynaceae include Adenium, Pachypodium, and Plumeria. Asclepiads deserve wider recognition by plant enthusiasts for their unusual and often brightly coloured flowers, with a characteristic five-fold symmetry. 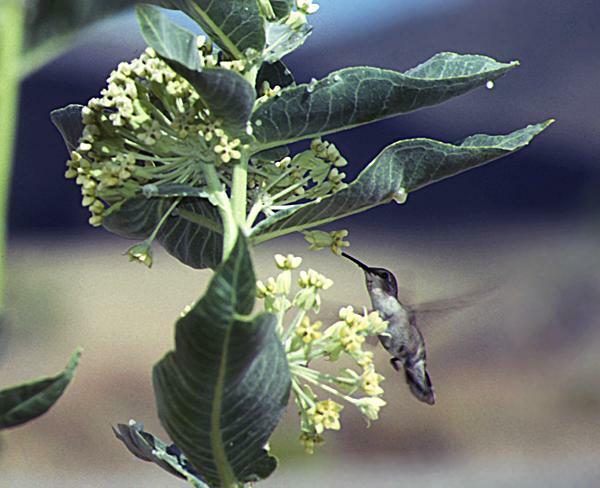 In many species the cut stem exudes a milky sap (hence the common name "milkweed") and the flowers are followed by pairs of pods containing tightly-packed seeds attached to silky parachutes. 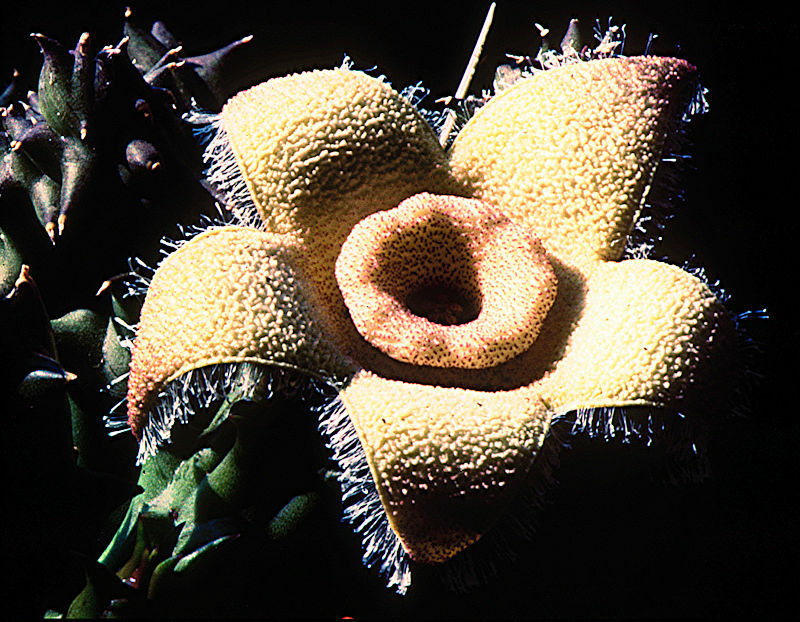 Some succulent Asclepiads are pollinated by blow-flies. 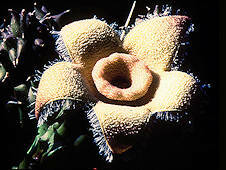 The perfume and hairy texture of the flowers in this group mimics that of rotting carrion. However, many Asclepiadaceae have unperfumed flowers, or in the case of Hoya, a sweet spicy scent produced during the evening and night. Stephanotis floribunda the 'Madagascar jasmine' is sold widely in garden centers because of its perfumed white flowers. Some non-succulent, frost-hardy Asclepias species are suitable for use as garden plants and are attractive to butterflies and humming birds. 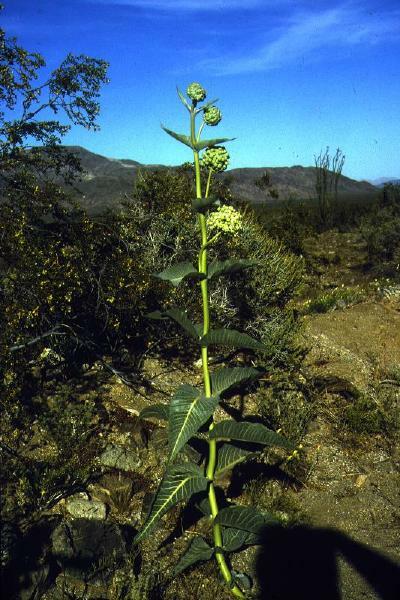 However, in warmer countries species of Asclepias have become serious weeds. Regrettably, the perfume of the flowers illustrated below can not yet be transmitted through the internet, but you can click on the pictures to enlarge them. Plants grown and photographed by RJ Hodgkiss except as indicated. This succulent asclepiad from the South African Karroo has attractive off-white odourless flowers about 7.5 cm in diameter. It is relatively easy to grow and propagate and quite free-flowering, but likes to be kept warm. However, in 1996 plants kept absolutely dry survived in a cold-frame through an exceptionally cold U.K. winter. The fringe of hairs on each petal is disturbed by the slightest air currents and is almost always in motion. Frerea (once included with Caralluma as C. frerei) is a monotypic succulent genus from India, with a very limited distribution of plants growing in crevices of cliffs at altitudes of around 3000 ft. 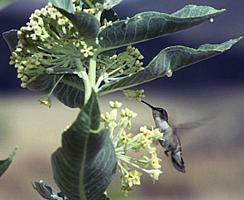 Although widely cultivated, it is considered endangered in its habitat. 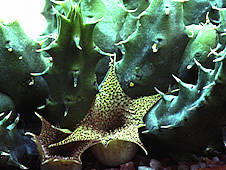 Frerea indica is unusual among stapeliads in having leaves on the succulent stems. The leaves can be shed in dry conditions. Some clones have flowers with ciliated edges, although the petals of this specimen only have a few hairs. In cultivation, this plant needs to be kept warm, especially through the winter. Seen here in flower at RBG Kew. 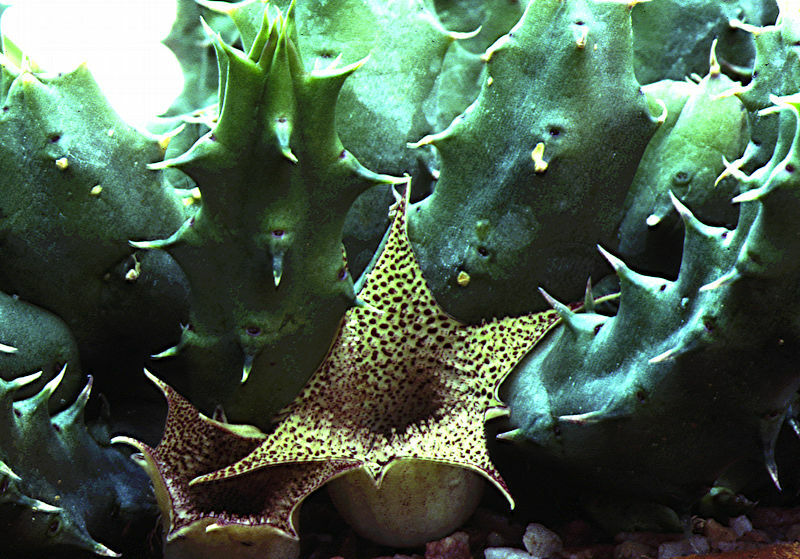 An easily-grown Huernia, with attractively furry flowers, about 2 cm in diameter at the base of the angular succulent stems. 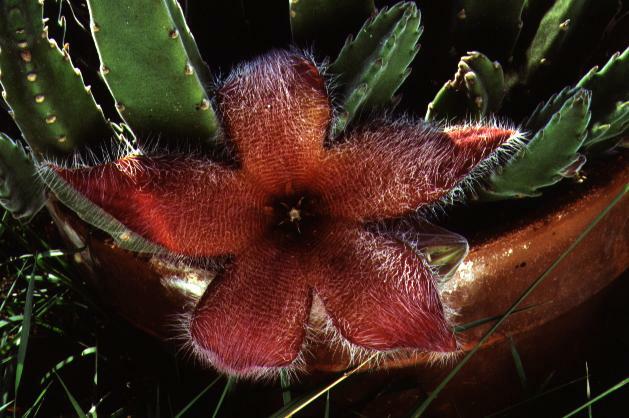 The flowers of many Huernias produce a characteristic perfume rather similar to that of a mouse that has been dead for some time, and is especially pronounced in my clone of this species. 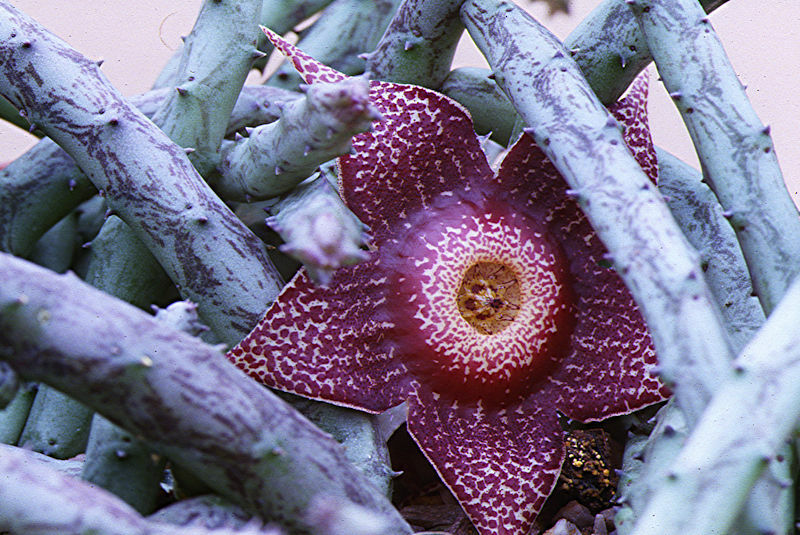 Huernia Boleana is found growing on cliffs in the Bole valley in Ethiopia. 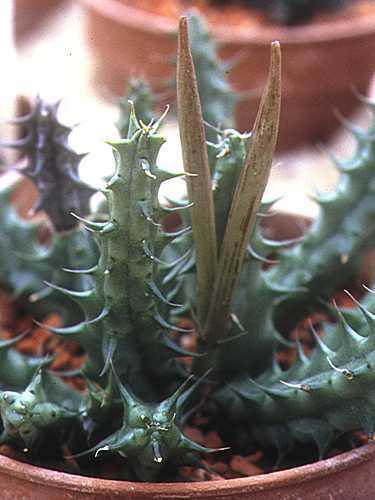 An interesting succulent plant from the Transvaal, with brittle stems that tend to break at the joints. Hence when repotting, it is difficult to preserve a large plant intact and one tends to end up with a handful of cuttings. In any case the stems tend to elongate and grow out of their pot, so a good specimen plant is a challenge. The stems become attractively marbled in a strong light. The attractive (but smelly) flowers, about 7.5 cm in diameter, generally open facing down on my plant and are therefore hard to photograph - except for this one. 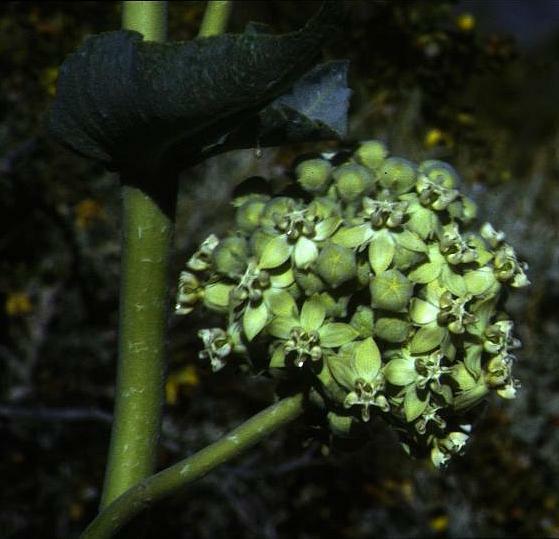 The semi-succulent desert milkweed with striking green balls of florets, photographed in April 1995, in the Anza-Borrego Desert State Park, California. Asclepias species produce nectar which attracts pollinator flies such as hoverflies and wasps such as the tarantula wasp. 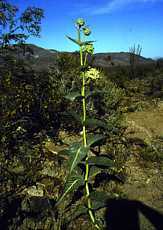 Desert milkweed is widespread from southern Utah to southeastern California, western Arizona and northwestern Mexico. Asclepias species are often known as "butterfly weeds" and cultivated as the food plant of the caterpillars of several species of butterflies including the North American Monarch butterfly Danaus plexippus.